Testicular torsion, caused by a twisting of the spermatic cord resulting in testicular ischemia, is a time-sensitive urologic emergency. While the highest prevalence is found in those under the age of 25 (approximately 4.5 cases per 100,000 people), it is important to remember that TT may occur at any age. [1,2,3] Due to its nonspecific physical exam findings and varied presentation, TT remains the third most common cause of medical malpractice suits in the pediatric population. Therefore, it is imperative that acute care providers understand the most common pitfalls in diagnosing TT in order to avoid potential missed diagnoses and potential litigation. It is well known that TT may present with isolated abdominal pain, however, many providers still neglect the testicular exam when evaluating this population. In a 25 year retrospective review of almost 600 patients, 22% of patients with TT reported intense abdominal pain that preceded and often exceeded the scrotal pain. In a systematic review of state appellate TT malpractice cases filed from 1985-2015, 31% of patients presented with abdominal pain as the chief complaint, while lack of a genital exam cited as the most common reason for malpractice. It is imperative to think of TT and perform a genitourinary exam in patients with abdominal pain. A thorough exam includes inspection, noting any discrepancies in testicular size, swelling, rashes, erythema, penile discharge, blood at the meatus, and presence of hernias. The cremasteric reflex should be assessed bilaterally by stroking the skin of the upper inner thigh while observing scrotal rise. Finally, each testis should be palpated using the thumb and first two digits, assessing for tenderness or abnormal lie. These findings should be detailed and well documented in all patients with abdominal pain. “Classic” TT physical exam findings include abnormal testicular lie, absent cremasteric reflex, tender testicle, and +/- blue dot sign. However, only 50% of patients have “classic symptoms,” namely a swollen, erythematous, and tender scrotum. Additionally, it should be noted that multiple studies have demonstrated the presence of a cremasteric reflex in patients with TT. The cremasteric reflex carries an 88.2% sensitivity and 86.2% specificity for diagnosing TT and should not be used in isolation. When absent cremasteric reflex is combined with nausea/vomiting or ipsilateral scrotal skin changes, sensitivity increases to 97%. Emergency physicians (EPs) with a high degree of clinical suspicion for TT should not be dissuaded from pursuing a diagnosis of TT in the face of a preserved cremasteric reflex. Ultimately, the entire clinical presentation, including history and physical exam findings, should be considered. Recent literature has shown that testicular viability extends past the traditional six hour window, potentially up to days. [1,12,13] In a large meta-analysis of 1,140 patients, 80% of testicles are salvageable after six hours after initial onset of pain. More specifically, 89% of those with symptoms lasting seven to 12 hours, 47% of those with symptoms lasting 13-18 hours, and 31% of those with symptoms lasting 19-24 hours were viable as confirmed by surgical exploration. Furthermore, one may not have a reliable time of onset for cases of testicular torsion. Furthermore, there have been reports of TT causing compression of nerves within the spermatic cord and subsequent testicular anesthesia. The time course of TT is highly variable and is not a sensitive enough marker for testicular viability. Thus, EPs must maintain the same sense of urgency when faced with a diagnosis of potential TT despite a time to presentation greater than 24 hours. Scrotal US remains a valuable adjunct in the diagnosis of TT, however, it has a sensitivity of 76%. Testicular vascularization may appear normal or even increased in a torsed testis on US, due to the fact that testicular blood flow diminishes gradually as ischemia progresses. Furthermore, the whirlpool sign which depicts the spiral twist of the spermatic cord on color Doppler US may be highly specific (99%) but is not 100% sensitive. [14,16] For these reasons, there has been a variety of medicolegal cases successfully litigated against the EP for a patient with a ‘normal’ US. Therefore, if clinical suspicion is high with a seemingly negative US, consultation with a urologist is reasonable and may avoid a missed diagnosis. TT is a common cause for litigation against EPs. All patients with abdominal pain must receive a genital exam, with the knowledge that there are no 100% specific or sensitive findings for TT. Similarly, symptom time course should not be used to predict testicular viability and evaluation should be pursued aggressively. Ultimately, EPs should not hesitate to contact their urology colleagues in cases where physical exam and imaging studies are inconclusive. The variable presentation of TT makes it a challenging diagnosis but with these insights, EPs will be better equipped to avoid misdiagnosis and medicolegal costs. 1. Visser AJ, Heyns CF. 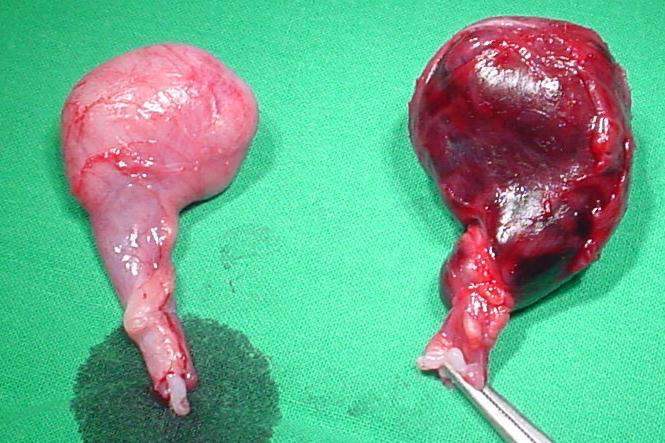 Testicular function after torsion of the spermatic cord. BJU Int. 2003;92(3):200-3. 2. Sidler D, Brown RA, Millar AJ, Rode H, Cywes S. A 25-year review of the acute scrotum in children. S Afr Med J. 1997;87(12):1696-8. 3. Perry S, Hoopingarner D, Askins D. Testicular torsion in the older patient. Ann Emerg Med. 1983;12(5):319-20. 4. Bass JB, Couperus KS, Pfaff JL, Moore GP. A Pair of Testicular Torsion Medicolegal Cases with Caveats: The Ball's in Your Court. Clin Pract Cases Emerg Med. 2018;2(4):283-285. 5. Mellick LB. Torsion of the testicle: it is time to stop tossing the dice. Pediatr Emerg Care. 2012;28(1):80-6. 6. Anderson JB, Williamson RC. Testicular torsion in Bristol: a 25-year review. Br J Surg. 1988;75(10):988-92. 7. Gaither TW, Copp HL. State appellant cases for testicular torsion: Case review from 1985 to 2015. J Pediatr Urol. 2016;12(5):291.e1-291.e5. 8. Galejs, L., Kass, E. Diagnosis and Treatment of the Acute Scrotum. Am Fam Physician. 1999; 15:59(4), 817-824. 9. Vasdev N, Chadwick D, Thomas D. The acute pediatric scrotum: presentation, differential diagnosis and management. Curr Urol. 2012;6(2):57-61. 10. Paul, E. M., Alvayay, C., & Palmer, L. S. How useful is the cremasteric reflex in diagnosing testicular torsion? Journal of the American College of Surgeons. 2004;199(3), 101. 11. Srinivasan A, Cinman N, Feber KM, Gitlin J, Palmer LS. History and physical examination findings predictive of testicular torsion: an attempt to promote clinical diagnosis by house staff. J Pediatr Urol. 2011;7(4):470-4. 12. Shukla RB, Kelly DG, Duff FA, Guiney EJ. Acute scrotum: testicular torsion. Ir J Med Sci. 1983;152(4):157-9. 13. Kalfa N, Veyrac C, Lopez M, et al. Multicenter assessment of ultrasound of the spermatic cord in children with acute scrotum. J Urol. 2007;177(1):297-301. 14. Dajusta DG, Granberg CF, Villanueva C, Baker LA. Contemporary review of testicular torsion: new concepts, emerging technologies and potential therapeutics. J Pediatr Urol. 2013;9(6 Pt A):723-30. 16. Mcdowall J, Adam A, Gerber L, et al. The ultrasonographic "whirlpool sign" in testicular torsion: valuable tool or waste of valuable time? A systematic review and meta-analysis. Emerg Radiol. 2018;25(3):281-292.